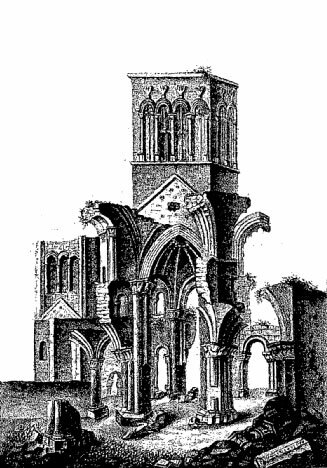 Shown above is a 19th century print of the ruins of Montebourg Abbey in the diocese of Coutances, Normandy. Richard de Redvers was buried at Montebourg in 1107. Lewis C. Loyd had the Moreville family holding land of Reviers (Redvers) in England after the conquest. Many researchers believe the Saint Clairs of England came north to Scotland with Hugh de Moreville. He later granted them lands which became their Hermanstoune holdings. William de Moreville" donated property to Montebourg abbey, for the souls of "his wife Mathildis and his son Eudo. Son Eudo confirmed it in 1174. Roger de Stuteville (Stotvilla) witnessed Eudo's confirmation. The Stuteville name is quite interesting in our history. A Helwis (Heloise) de Stuteville was married to a Hugh de Moreville. There was more than one Hugh de Moreville. The one who married Stuteville was the Forester of Cumberland. Robert de Vaux and Roger de Stuteville were Sheriffs of Cumberland and Northumberland, 1170 - 1185. Their families were, at one time, both prominent. They worked together in silver mining and minting. William d'Aubigny (Albini), the Earl of Arundel, granted lands to Montegourg Abbey. 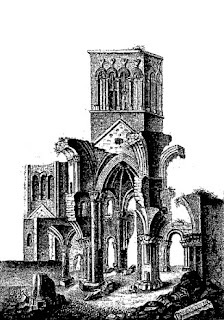 He also gave to Thetford Priory, as did the de Vaux, Warenne, Haga (Haig), Malet, Bigot, and Longespee (Earl of Salisbury). In 1175, Gilbert de Hunfrancvilla (Umfranville) gave his chapel of Douna to Montebourg Abbey for the well-being of his soul and those of his family living and dead. Among the witnesses was Philippo le Ver (Vaux).